Dupree students, working as Just Breathe Suicide Prevention Ambassadors, recently worked with Nicky White Eyes and Terri McLellan to bring more positive messages to the Dupree school environment. 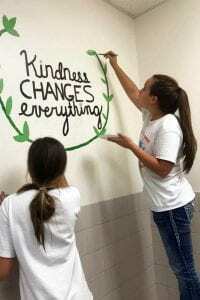 The six students met over the weekend and one school night to paint inspirational positive messages in the bathrooms at Dupree School. 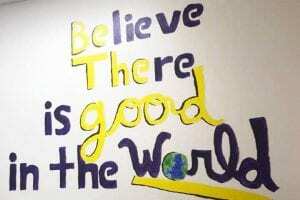 The students who painted the messages were Kennedy McLellan, Shayna Farlee, Clifton Birkeland, Maxwell Peacock, Tayla Thorstenson and Chessa McDaniel. The Just Breathe Campaign was started by Nicky’s daughter, Sha’Teal Pearman, and is working to spread affirmative messages in an effort to prevent suicides throughout the area. If you know someone that is struggling with suicidal thoughts, please encourage them to seek counseling or call the suicide prevention hotline at 1-800-273-TALK.